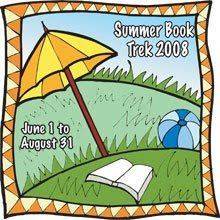 One of my favorite blogs, LDS Fiction, is hosting a Summer Book Trek. Since I'm a reading addict, I thought it would be totally fun to join in! I only have evening and weekends to read, since I'll be finishing my Teaching Special Spirits manuscript. But I'm pretty sure I'll finish this list . . . and end up adding more! Anyone else want to join in on the reading fun? You can pick any books you want to read. There's no limit (even one or two is fine!). You can be any age, too. I'm thinking of signing up my six-year-old. She takes after mom and reads, reads, reads. The best part . . . there are prizes and awards! Wow, wow, wow. You are a reading maniac. Can't wait to read your reviews, you woman, you. You have a great list. I've read several of them. Thanks for participating and happy reading! My daughter has a summer reading list from school that I've agreed to read along with her. It's going to be a fun book-filled summer. Ooh - I've been wanting to read Summer of the Monkeys. I have a friend who reads it every year! I didn't think to add the list of stuff my kids are reading this summer. But I do want to sign MJ up for the reading trek. I think she'd have fun! I just read Farworld and it serious rocked! You're going to love The Moroni Code and Of Goodly Parents. Uhm, I'm not sure I've read any of the other. Enjoy! Hey, would you be willing to a stop on my virtual book tour this month. I'm promoting "Forged in the Refiner's Fire." I had some people drop out so I'm trying to fill in some spots. I'd love to be part of your tour! I'll email you. Brenda from Pebbles emailed me today and she's sending your prize from the contest out tomorrow so it should arrive next week. Awesome! I can't wait to get it and check it out! Thanks. ooo, you have some good ones on your list, lots too! I really liked House on a Hill. Hope you enjoy it too! I've read 4 of them. I loved 13th Reality. I have Farworld on my list too. I almost got The Moroni Code but I haven't heard anything about it, so I'm looking forward to your review. I'm really excited about the reading trek. It's going to be fun to read everyone's reviews. Thanks for stopping by! Ooh - I'll have to watch for your review on that one. Happy reading! Hi Melanie. Just wanted to let you know, I'm hosting my second annual Summer Reading Thing over on my blog. It starts this Friday, June 20th. The rules are similar to this one, very easy and you can use this same book list to double your chance at prizes. Hope you'll join me.